I will think about it but you do not need Nokor needles to perform subcision. "Ordinary" needles such as diabetic needles will do for ordinary scars. It is not easy to perform or self-perform horizontal needle subcision - you can end up with skin nodules or possibly even small scars. You should certainly first try many dense and deep vertical needlings with our very thin single needles, combined with some kind of suction method and saline injections (I wrote a forum posting about saline injections). Only if this method fails should you consider horizontal subcision. Dermarolling / Microneedling / Saline Solution-Where to Buy? You can buy diabetic needles in the pharmacy. Buy the smallest gauge. Dermarolling / Microneedling / Will Derma Rolling work to fade my scars? Your redness looks like acne-related post inflammatory hyperpigmentation. Anything that speeds up the turnover of the skin - such as dermarolling - will speed up the diminishing of the hyperpigmentation. I would recommend a 0.5 mm dermaroller used twice a week and Tretinoin (the A-Ret gel) which also speeds up the turnover of the skin. You should be aware that Tretinoin may initially make the skin even redder before it gets better but long term use (every other day) will keep acne in control and fade the redness. A pea size of Tretinoin is sufficient for a whole face. The more is not the better concerning Tretinoin. If you apply too much, your skin will be dry and irritated. If inflammation is still present in your face, mix several drops of water into Aspirin which is an anti-inflammatory (Paracetamol is not Aspirin), apply it on your pigmentation and cover it with plastic foil. By "fading my scars" do you mean if dermarolling will help fading the redness of your scars or are your scars also indented and you would like to make them shallower? It is very difficult to see on your photo whether it is just redness or indented scars. First try to solve your hypopigmented patches with a 0.5 mm dermaroller and the single needles (use them on your shallow scars as well). If your shallow scar do not improve you can later buy a 1.5 mm roller or a 1.5 mm dermastamp. Intense Pulse Light (IPL) or lasers work on the same principle. It heats up the skin. The tissue absorbs light from the laser and that heats it up. Everything in the skin absorbs laser light but some parts (for example dark colored parts) absorb it quicker, especially if specific wavelengths of light are used. Red pigments can be heated best with blue light, etc. Thus you can target hemoglobin in blood and destroy (seal) spider veins by heat. In laser epilation, you target melanin in the hairs and the heat will temporarily weaken the hair bulb. You can target tattoo pigment etc. You can stimulate collagen production by slightly heating up the skin or use more energy and evaporate a layer of skin or just fractions of skin (Fraxel). The problem is that even if you target a specific part of the skin, the other parts heat up as well and in some unfortunate cases, the heat destroys for example melanocytes (pigment producing cells) as a collateral damage and you end up with hypopigmented spots or with scars and hyperpigmentaion when too much heat was used or the skin overreacted to heat. To show you how fine is the line between positive and disastrous results, there were cases in laser epilation, when the treatment actually stimulated growth of thicker and coarser hairs in the area above the lip because to avoid potential burning of this sensitive area, the epilation laser was set too low and instead of paralyzing the hair bulbs by intensive heat, the bulbs were just slightly heated which actually stimulates them. Skin also contains melanin and setting the laser up too high can burn the skin. Using enough energy to destroy or stimulate certain target but not too much in order not to burn the skin is very difficult and what works for one person can be too much or not enough for the other. If your hypopigmented spots are flat (no scars) the best is to roll the whole area with a 0.5 mm roller and needle the individual white spots with the single needle. You do not have to needle deep because melanocytes are at the bottom of the epidermis and that is rather shallow. You should needle the white patches and also needle a little over the edges of the white patch to facilitate the migration of melanocytes from the surrounding normal skin into the white patch. When you complete several needlings, expose your patches to the sun because melanin is produced as a reaction to UV (provided there are melanocytes cell in the area to produce it). The improvement observed shortly after dermarolling is due to swelling but the swelling usually subsides within 24 hours and within days after deep single needling. There is certainly no swelling after 4 weeks. Yes different areas do react differently but it is individual. I do not think there is significant difference in the healing of various skin areas if you go to the same depth but dermarolling may for example improve scars on the forehead but not on the chin etc. Using the same dermarolling frequency and technique I managed to improve wrinkles around my lips but not so much around my eyes. Thank you for this update, Anna. It is great that you see results! >between for the same area? You can do it at the same time but after dermarolling with a 2 mm dermaroller, the whole rolled area becomes red and you may have difficulty to see the stretch marks and target them with the needle. >or shower with shower gel (because of infection) (using 2mm needles)? back to your ordinary lotion. The skin must be hydrated.The more the better. Yes, a wound healing cream is very suitable. The cream should be in a tube because a tube has little risk of bacterial contamination. >counted from the day of operation? Dermarolling / Microneedling / Betadine Use? If you wait a little, that water will evaporate from your face by itself. You can also start dermarolling while still wet. The needle has a stop to it, but that stop is between 2 and 1.5 mm, approximately. The "toothpick" article explains in great detail (with pictures) how to very simply "stop" the needle at a shallower depth, when needed. A real tear trough is caused by advanced aging - sagging of the cheek and herniation of the fatty padding of the cheek. Some individuals have genetically very little fat or bone in that area and it results in hollowness under the eyes. Dermarolling cannot improve any of the above described conditions.. The eyelids have the thinnest skin in the body. Dermarolling can thicken the skin which can slightly improve dark circles under the eyes caused by the color of the muscle underneath the skin that is visible through the thin skin (you cannot use a dermaroller directly under the eyes though). should be very proud that you managed! Most people don't. Give your body some time to adjust to your new shape. It is quite likely that the loose skin will improve by itself but it will take some time. However, if you lost an enormous amount of weight, the skin will not adjust and it has to be removed by a plastic surgeon. There is no way a dermaroller or anything else but plastic surgery could fix lots of excessive skin after a dramatic loss of weight. 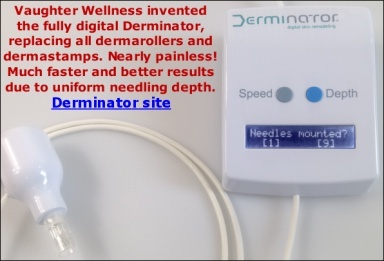 If your skin adjusts to your new shape and you hopefully end up merely with mild skin laxity and stretch marks, then buy a 1.5 mm dermaroller. You may still get results from the single needling if you continue. You can also try applying A-Ret gel into the needled scar immediately after needling. Do a test patch on one scar to see what will happen. If the injury was very deep, there may be no other way than using some injectable fillers. Unfortunately most of them last only temporarily and the long lasting ones can end up with nodules or other problems. You can perhaps consult a plastic surgeon about it.